At the school where I've been working, one of the little girls, Sienna, was completely crazy about wolves; in particular the wolf in Little Red Riding Hood, but she'd be pretty pleased to be given this book to read too. If there's a wolf in it, Sienna will read it. This particular wolf is found as a baby, on the doorstop by Mr and Mrs Bunny who think he's ever so cute and decide to bring him up as their own. Through all his adorable behaviour, and much eating of carrots, bunny-daughter Dot is the only voice of reason: "He's going to eat us all up!" However Dot is not the potential dinner, but the hero, in the dramatic climax of the story. These lovely characters are so full of personality. 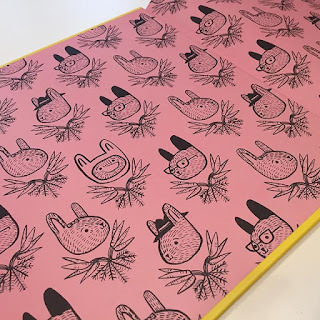 I love the strong line of the illustrations, with the sunny colour palette of pink, yellow and red, plus grey Wolfie, often in his gorgeous pink bunny suit (a potential book character costume in years to come, I'm sure). 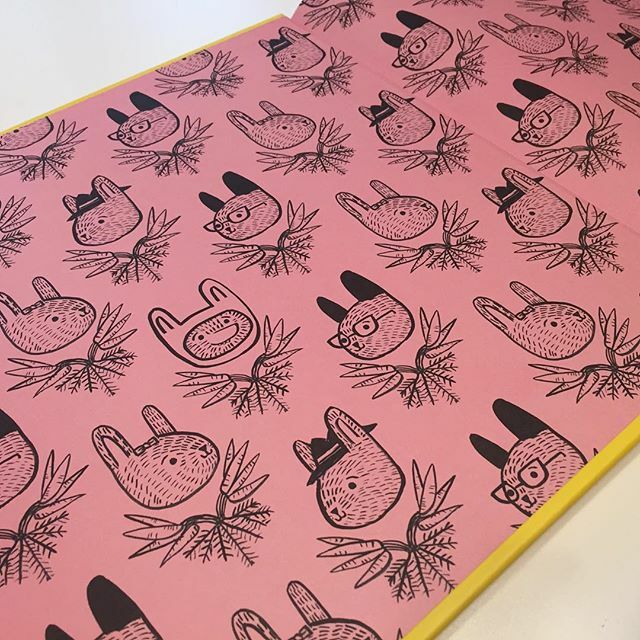 I'm also a sucker for great end papers and these are certainly special. 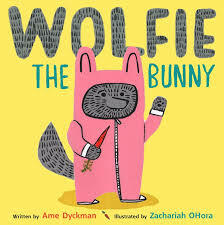 Wolfie the Bunny is in the running for the Caldecott Medal this year (being announced very soon) and had a great write-up in the Mock Caldecotts on Horn Book's website. If you're not familiar with Horn Book, it's an excellent American magazine all about children's books and one of my go-to resources to find out what's great in the US book world.